There may not be another alumnus of a school who had the beaming pride of being called a graduate as Earl Dolive 40BBA. 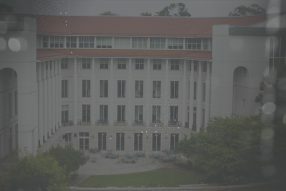 Simultaneously, if a school is defined by its graduates, business education at Emory University fittingly beams to be associated with Dolive, his career and his character. Multiple current and former members of Goizueta Business School recall the late Dolive as someone who routinely, and unabashedly, offered friendship, counsel and support to everyone from undergraduates to the dean and other senior staff. Colleagues remember Dolive sharing — often for several minutes during Dean’s Advisory Board meetings — how then-Emory Business School had a tremendous impact on his career. Perhaps most notable to Dolive was how Emory gave him a scholarship, which enabled him to enroll. That changed the trajectory of his life, which lasted 95 years. In 1997, Dolive donated a $250,000 in support of a new, technologically advanced business school building. He did so, in part, because he was drawn to the vision of then-Dean Ronald E. Frank. Dolive, who died on Feb. 26, 2013, rarely missed a board meeting. If he did, it was for good reason, like the time a brown recluse spider bit him after his daily swim. Mazursky recalled how Dolive would meet with former Dean Larry Benveniste at the Cherokee Town and Country Club to talk about the school. Conversations often went beyond two hours, in which he introduced Benveniste to everyone he passed at the club. Benveniste said Dolive repeated a similar message at every advisory board meeting. Earl Dolive was recognized as one of the 175 History Makers. "Earl Dolive was one of the brightest and most creative executives I have ever worked with." Dolive graduated from Emory with a degree in accounting. He served in the Army Air Forces throughout World War II. Dolive was the chief administrative officer for a hospital with the 20th Air Force in India until his discharge in 1946. As an employee at Genuine Parts, he worked his way up from a job in the stockroom to head of purchasing at the company's Charlotte, N.C. branch. He eventually landed in Atlanta as vice president of finance for the company and was appointed vice chairman in 1974. In 1989, Dolive was awarded the Distinguished Service Citation by the Automotive Hall of Fame for helping to make Genuine Parts one of the largest automotive wholesale distributors in the country. But he may be most remembered for his contributions and attention to customer service and employee relations. Julie Barefoot, Associate Dean of MBA Admissions, remembered Dolive as a one-of-a-kind, sweet, kind Southern gentleman with a heart of gold and a twinkle in his eye.